Where can I find sample code for this indicator approach ? I wish I knew. I saw those videos as well and it's an interesting indicator. I'm interested in how one breaks the orders into various sizes using EasyLanguage. Does anyone know how this is done? you can program it in EasyLanguage. and in no time you will have your strategy coded. I know you guys wanted it for TradeStation, but I think TS and NT are compatible, if not you can get a demo for NT through Mirus which will never run out and apply it there. I believe this is it for NT. This is not my own creation. I downloaded it off of NT Script page. I will let you know tomorrow how it works. I have it set to filter at 100 so it does not work in after hours really. Thanks for posting the code. Looks like that's a c# program which I don't believe will work with TS. I did some research and found the EasyLanguage command TradeVolume which displays the trade volume on the last trade. I'm trying it out on a 1-tick chart in the after hours market on EC. It looks like a crude start. Let me know how it works for you and if it is like the one in the video. I could use MultiCharts with my feed. Thank you for the breakdown of how it works, I am trying to code in NT, using the wizard........this will help very much. Thanks. I understand that the Volume Splitter is plotting time vs. sales (or more specifically the volume in terms of "large" orders when you have it set to follow large contract players). Cooper59, I'm interested in what indicator you are using to see the order size in TradeStation. If you are using "Sales" to help in your trading, how are you accessing this information in TradeStation? This is the indicator I posted above using NT, filtered to 100 or more contracts on a 610tick chart. Also, it says here Trading Platforms. NINJATRADER. Brokerage and Data Feed Support. that NT and TS are compatible. Hope it helps. 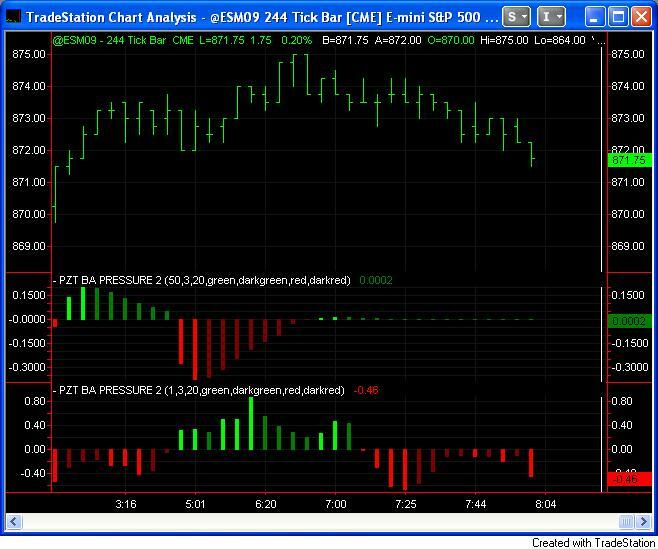 TradeStation is BOTH a broker/datafeed AND charting software. in the page link above, it is referring to TradeStation as a Supported Market Data Vendors. They are not talking about NT and TS as code compatible. I've tried to duplicate the EOT Volume splitter before but to no avail. I'm just not that good with easylanguage. Good luck to anyone who does get it because I truly think its a great idea and a valid concept (and the EOT guys are making a killing using it to confirm trades!). Deadalus, I tried to create it as well. I’m not familiar with how to extract the required information. For example, there are two pieces of information I need. 1) How to extract the order size. In TS there is a command called “TradeVolume” (find an example here) which is suppose to give the size of the last trade. But how does that work in relation to an indicator that might be running on a 233-tick chart. 2) Next, how do you determine if a given trade size was a Long or a Short? I was not as impressed with the Ninja Trader version as I hoped (eotpro seems to make calls before the move quite often, the indicator I posted acted more like an RSI or a fast MA (after the fact). I have been in contact with some C++ programmers to build one the same as eotpro.com's. The programming is somewhat expensive, however if it ends up being the same as eot it would be well worth the price over and over. Anyhow, what I am getting at was you should look into this option, I am sure there are many more TradeStation programmers than those for NT. I hope it works out for you guys. Well i started trying to code something like this up again today. But don't hold out hope folks... i'm about as useful with easylanguage as a blind person is at officiating a boxing match. But i'll keep messing with it. Thanks. When possible, I'll lend a hand with coding. I can't find TradeVolume anywhere on google searches... it just references me back to this thread actually. It would be nice to know exactly what and how i'm calling things up. Some things to consider... in the EOT videos they are able to show volume history on the indicator historically (ie it doesn't have to run in real time) which is somewhat odd because the TradeVolume function doesn't allow you to call up historical data. It throws an error if you try and use TradeVolume to get the previous entry... so maybe they are doing it some other way? TradeVolume is an elusive beast. I found it on the Trade Station Forum about a week ago. Individual trade volume is not provided by the exchange for the ES contract. The volume of several trades can be consolidated into a single tick. This practice is known as "tick netting." "The quote field TradeVolume is not updated with each trade tick. Like other quote fields it is updated periodically... It is what we refer to as "snapshot" data. So, what we seem to have is an imperfect way of obtaining trade volume on an intrabar basis. This is a start. However, now it seems the EOT indicator can be used with historical data?! This is strange. if I see it right, in the second video MultiCharts is used. I think you have seen this already, but just in case. My broker made clear right from the start, that he uses this method. Currently I think, that many brokers use it. In this way or another. But in my view the raw data, would simply overload the internet at some times (for example FOMC days). they and you would pay this in time (i.e. you lag or crash). you don't just order 200 ES contracts, instead you order 200 times 1 ES contract. You "pulse" your order. From the commissions side it should be the same, so it makes sense to me. my broker says they should be accurate, and it seems to be true. (i.e. move on very high volume or move on very low volume to prepare ... whatsoever). I think you see it even better. what I meant to say. If you like? Thanks Hal9000. Yes, please do post your screenshots. I modified the Bid/Ask Pressure indicator to use TradeVolume instead of Volume or Ticks. This should give an approximate value representing the trade volume of the last order. Further modification may be necessary to the indicator will most likely be needed. Below is a chart from the overnight ES market. I know it’s not the best time to run the indicator but I just wanted to see if I was on the right track. The first indicator was using an order size filter of 50 or greater. The second indicator (the one on the bottom) had an order size filter of 1. The first thing you notice is they do track differently. I will let this run during “normal” market hours today and post the results. I may play around with the indicator a bit more (as I have some ideas to test) then if all looks well, I’ll post it. Didn't come up with much. Even with modifying the BA Pressure indicator to look for size it still leaves the fundamental question of how they are pulling this data historically and not just real time... and its one I don't have an answer to just yet. Awesome SwanJR. Look forward to your observations today.